Round 2 in the Clare senior football championship produced a number of shock results, not least of which was the defeat of champions Cratloe who went under by a point to Cooraclare on Sunday evening in Clarecastle. There was little between the sides throughout the contest and they went to the break at 1-5 each. Cooraclare showed the greater hunger in the second half and this helped them to get over the line and into the quarter finals while the champions will be in round 3 action as they seek to keep their hopes of a third title in a row alive. Last year’s beaten finalists Eire Og are out of the title race after suffering a two point loss to Lissycasey on Saturday. A strong second half showing from Lissycasey proved decisive as they outscored the town aside 0-6 to 0-1 in the final twenty five minutes to book their passage to round 3. Eire Og now find themselves in the relegation play off where they will be joined by Doonbeg who were surprisingly defeated by St. Senans Kilkee at Kilrush on Sunday. They seasiders had five points to spare and deserved their success on a day when Michael O’Shea played a key role in their win. The remaining two teams in the relegation battle are Shannon Gaels who suffered a heavy defeat from Kilmurry-Ibrickane on Sunday and Wolfe Tones when went under to St. Josephs on Saturday. Clondegad are safely through to the quarter finals after a comprehensive win over O’Currys while Kilrush are also into the last eight after they proved too strong for St. Breckans. 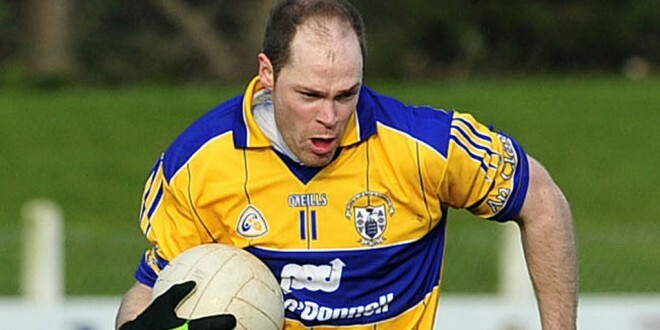 Miltown also sealed a quarter final spot when they had two points to spare over Ennistymon on Sunday in Kilmihil. Meanwhile Clarecastle, Kilfenora, and Kilmihil are safely through to the semi-finals of the intermediate championship while Corofin and Naomh Eoin remain in the hunt for the remaining play off spot.